Hosting for the holidays? Your family is sure to fall in love with this mouthwatering gluten-free lasagna, which is also perfect for serving to guests following a gluten-free diet. 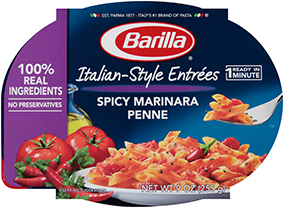 With Barilla Gluten Free Oven-Ready Lasagne as its base, this is a simple yet delicious way to enjoy the classic Italian dish, totally gluten-free. Hearty flavors, Italian cheeses and fresh vegetables round out this pasta recipe, which is guaranteed to have everyone lining up for seconds. 1. In a large skillet, add extra-virgin olive oil and onions and sauté for three minutes. Then, stir in the garlic, cook for approximately one more minute and add the ground beef and ground pork. 2. Brown the meat well over high heat(about 10 minutes). 3. Deglaze with red wine and simmer until wine has reduced (approximately two to three minutes). 4. Add yellow cherry tomatoes and San Marzano tomatoes, bring to a boil and season with salt and pepper. Allow to simmer for ten minutes. 5. Add the asparagus and carrots and cook for one more minute. Then, remove the skillet from the heat. 6. In a 13 x 9 greased pan, layer 1/6 of the sauce mixture on the bottom of the pan. Cover with three lasagna sheets, Parmigiano cheese, mozzarella and sauce. Repeat this process until you have five layers. 7. Cover with aluminum foil and bake fo r40 minutes at 400° Fahrenheit. 8. Uncover and bake for an additional five to seven minutes at 400° Fahrenheit. 9. Allow lasagna to set approximately 10-15 minutes before cutting and serving.